Nearly 40 years ago, the United States Supreme Court set back public employees’ First Amendment rights by allowing public sector unions to charge agency fees and thereby make many public employees subsidize speech with which they disagree. Each year, this decision affects hundreds of thousands of public workers who are forced to choose between their political beliefs and a voice in their workplace. Justice Scalia’s recent passing likely will mean that public employees will have to wait a bit longer to have their constitutional rights restored. It may be that freedom’s advocates will have to fight the battle state by state instead of focusing mostly on the Supreme Court. In Abood v. Detroit Board of Education, the Supreme Court claimed that there could be a line drawn between representational activities, which it would allow unions to charge all employees for, and political activities, which unions could solely charge to members. The court rejected the argument that when dealing with a public employer, all employment and budgeting matters are political. Due in large part to the Mackinac Center Legal Foundation’s work exposing the home day care and home caregivers dues skims, in 2014, the Supreme Court refused to extend Abood to allow agency fees to be imposed on those types of workers. Instead the court actively questioned whether Abood remained good law. One case argued this January, Friedrichs v. California Teachers Association, was supposed to answer that question. The oral argument seemed to indicate that by a 5-4 vote the Supreme Court would overturn Abood and thus restore public employees’ First Amendment rights. Then Justice Scalia, who was expected to be one of the five votes for freedom, passed. There was some question whether the Supreme Court was going to hold the case until a ninth justice was confirmed. But in late March, the court indicated that the case was a 4-4 tie, which had the effect of a ruling against the teachers and in favor of the unions, since the lower court had to follow Abood. There are around 7.2 million unionized public sector employees (about 35 percent of all government employees). Many of these unionized employees work in states where unions are allowed to demand the employee be fired if they don’t pay agency fees. Our work in Friedrichs showed that where mandatory collective bargaining and agency fees are allowed, a touch over 90 percent of employees are union members. Where there is mandatory bargaining but right-to-work prevails (no agency fees), around 80 percent of employees are union members. Thus, hundreds of thousands would directly benefit from a return to the First Amendment’s proper meaning. Until a new justice is appointed to the Supreme Court, the agency fee-question is likely to be unresolved. The plaintiffs in Friedrichs have asked the Supreme Court to rehear the case when a ninth justice arrives and there are other court cases in the system. But depending on who wins the White House, the ninth justice may be unlikely to rule against unions. The Friedrichs case appeared to be an opportunity for a quantum leap in worker freedom. All public employees could have been freed from subsidizing union speech. But, while the appointment of a good justice is still possible, it may be that the freedom movement has to return to the important process of winning these battles state by state. The Mackinac Center has remained active in that process, and whether the issue is being litigated in the courts or in each state’s court of public opinion, we will continue to seek the just result no matter how many more years it takes. 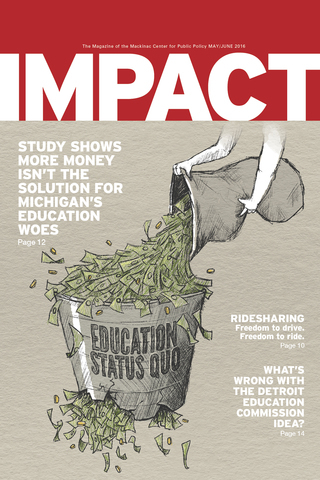 What’s Wrong with the Detroit Education Commission Idea?